Good morning! Wednesday. Praise for the middle of the week! Chronically neglected and too often considered hopelessly boring, most people seem have the impression that nothing important would ever WANT to happen on a Wednesday. Perhaps, but even if true I think Wednesday is under rated…there is much that can be written about the virtues of those boring moments…the calm before the storm, so to speak of. 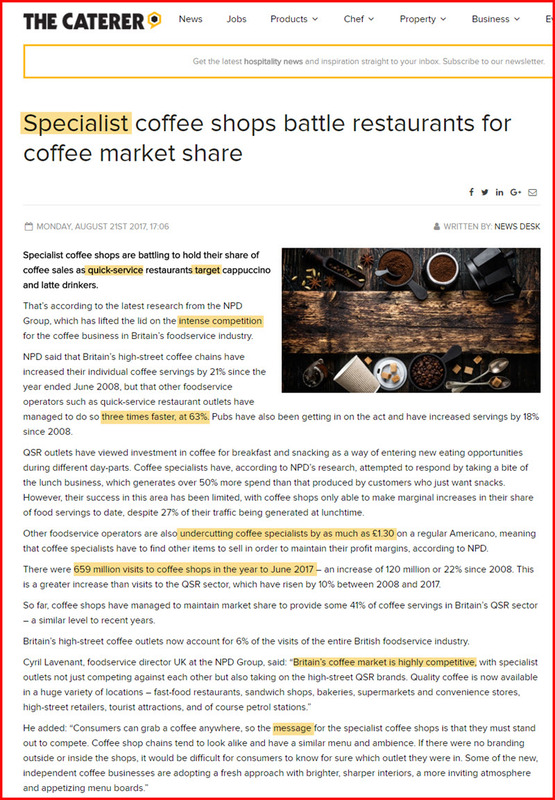 Isn’t that what coffee is really all about? 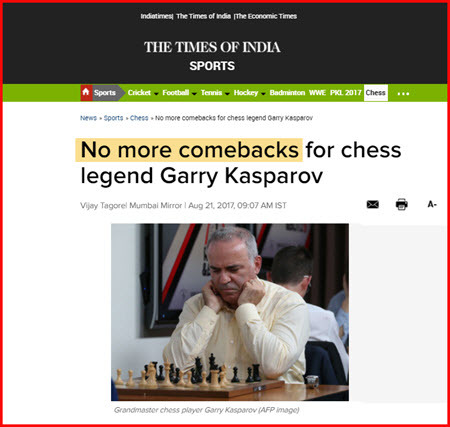 While not entirely ignored by MSM in the US, Kasparov’s little adventure in St.Louis against many of the elite players of today’s chess world disappointed predictions and did not come any where close to live up to expectations. Especially Kasparov’s expectations, no doubt. Fairly or unfairly, the chess world can now put to rest the dream of a Fischer like $5-million comeback similar to what achieved in Serbia back in 1992 against Boris Spassky. But what should one realistically expect from a player, even a legend such as Kasparov, who retired from the game more than a decade earlier? As my wife opinioned, Kasparov should have stayed away from rapid and blitz chess and played SERIOUS chess instead. Kasparov was never a great rapid and blitz champion. Only he can explain what he was hoping to achieve in St. Louis playing a young man’s game, but in any case it will be history that has the last word. Chess in MSM in USA…again for all the wrong reasons! 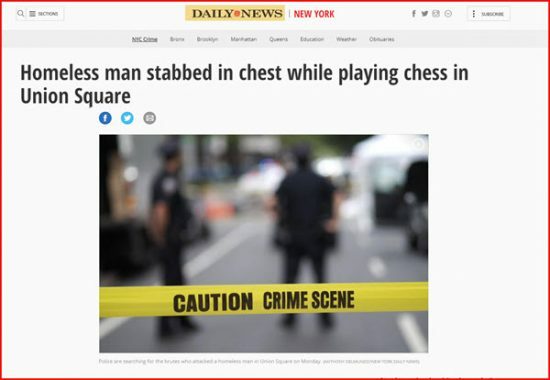 Continuing with the theme of MSM in the USA unrelentlessly marginalizing and shitting on chess’ visibility and prestige at every opportunity, this story of a homeless man being stabbed yesterday during a game of chess in NYC is making the rounds. Worse still, and to keep things in perspective, this little (but tragic) story has already had more MSM exposure than Kasparov’s entire 4-day comeback in St. Louis! What is wrong here? 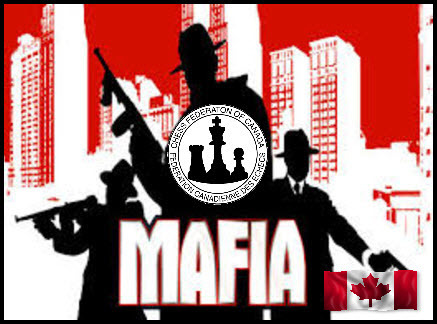 While we are on the topic of giving chess a bad name, I want to bring up the story of yet one more instance of missing money – or money that mysteriously goes unaccounted for – in the Canadian chess federation. Despite claims/innuendo to the contrary, Kirsan Ilyumzhinov has honored all of his financial committments made in the 2014 FIDE election. The question then raises itself: in the CFC executive is lying about Kirsan’s money? Why does the CFC president continue to mislead/de-rail any and all efforts to answer the $60,000 question? Pix and pricks and …chess!